A pneumatic conveying system transfers powders, granules, and other dry bulk materials through an enclosed horizontal or vertical conveying line. Controllable air is used to transport either vacuum or pressure materials through piping at a controlled rate. This system has quite a few advantages. It can be configured with bends to fit around existing equipment, which gives it much more flexibility. 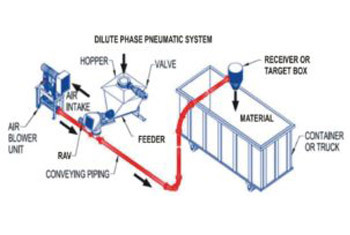 The pneumatic conveying also takes up less space, is totally enclosed, which allows the system to contain dust, and typically has fewer moving parts than other systems. Pneumatic conveying systems are grouped by their operating principle into two types: dilute phase and dense phase, which both can be run under a vacuum or pressure. Dilute phase conveying the particles being transported are at low pressure and high velocity and will be fully suspended in the conveying air. Dense phase conveying transports the particles are at a high pressure and low velocity, while they are not being suspended. Much larger distances may be accomplished compared to dilute phase conveying. Dilute phase conveying with pressure is one of the most common conveying methods for powders or granules, as well as fibrous materials. This system relies heavily on the air stream's velocity. The air stream's velocity picks up and draws each particle along, keeping them in suspension as they go through the conveying line. 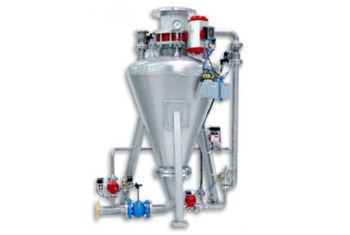 Dilute phase vacuum conveying is suitable for conveying materials that usually pack or compress under pressure. This system is usually used to transport materials over short distances at low capacities. In dense phase pressure conveying, the system conveys the materials at a lower speed to limit materials degradation, air consumption, and abrasion on pipeline, bend, and diverter contact surfaces. This system also has the ability to start or stop with the conveying line being full with material. In dense phase vacuum conveying fragile or abrasive materials are conveyed much more gently. Minimal damage, reduced erosion in the conveying line and being traveled longer distances are all advantages of this low velocity process. We hope you find this blog informative and helpful. Our goal is to introduce, explain, and teach process control terminology, applications, and products. Located in Westminster, MD., Process Systems & Design (PS&D) provides bulk materials handling equipment, plant systems engineering, specialty machine design, and process control engineering. PS&D has industry expertise and focus for bulk handling systems, Vape and E-Liquid, Biomass, and plastics and polymers. PS&D also specifies, sells, and installs bulk handling equipment such as pneumatic conveying equipment, screw conveyors, bulk storage equipment. blending / mixing / agitating equipment, dust collection systems, metal detection systems, pelletizers, crushers and hammer mills, bulk loaders and unloaders, and spray drying equipment.